Tidying up around the home is more than a tedious task for most. Some rush through tasks so quickly they forget some of the minor details of cleaning every nook and cranny. The housework checklist from Microsoft can help ensure you get everything done right the first time. The housework checklist template from Microsoft provides an easy way to tackle your cleaning duties. It can also be used as a nifty way to assign chores to other family members in the home. The housework checklist will even save you money for cleaning supplies. 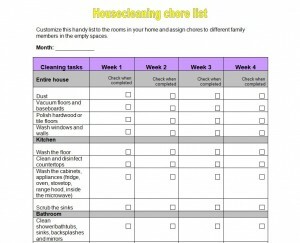 You can download and print the housework checklist instantly for free by clicking the link found on this page. The housework checklist comes in the form of an extremely readable Microsoft Word document. The housework checklist is customizable, so it can be altered in any way that would better suit you or your family’s needs. Horizontally, you will notice there are slots for each week of the month. Within each week is a check box for each task. Once a task is completed, simply mark it off on the housework checklist. Repeat this process throughout the checklist. Housework isn’t very fun, but you and your family can be more efficient with the housework checklist template from Microsoft. Download and print the checklist for free today!